by Agencies in Washington | South China Morning Post – President Truong Tan Sang rejects ‘nine-dash line’ assertion by China during visit with Obama, but stops short of joining Philippines’ UN plea. Vietnam’s president has voiced firm opposition to China’s claims in the South China Sea, but declined to back a bid by the Philippines to take the row to the UN. On a visit to Washington, President Truong Tan Sang rejected China’s “nine-dash line” through which it claims virtually all of the strategic sea, including islands close to neighbours. “We cannot find any legal foundation or scientific basis for such a claim and therefore it is the consistent policy of Vietnam to oppose the nine-dash line plan by China,” Sang told the Centre for Strategic and International Studies. But he declined to comment when asked if Vietnam would join the Philippines which in January said it was asking an arbitration panel of the UN Convention on the Law of the Sea to declare China’s claims invalid. “As a member of the United Nations, the Philippines has the legal right to carry on with any proceedings they would like,” Sang said. The Philippines and Vietnam have led criticism of what they consider increasingly assertive claims by China in the South China Sea. The Philippines has had especially tense relations with China, which seized the Scarborough Shoal, an outcrop claimed by Manila, after a two-month naval stand-off last year. But friction has eased slightly between Vietnam and China, with Sang visiting Beijing last month and agreeing to set up a hotline to try to prevent mishaps from escalating. China separately has increasingly butted heads with Japan, which fears that Beijing is trying to exert control over resource-rich waters in the East China Sea. Sang earlier met US President Barack Obama, who encouraged calm in the South China Sea. Sang and Obama called for “the settlement of disputes by peaceful means” and renewed support for a code of conduct to manage potential mishaps. It was the first visit of a Vietnamese leader to the White House during the Obama administration, and it took on an even greater strategic resonance, given Obama’s determination to increase the US presence in Asia. They pledged to deepen trade and military ties, even as they tangled over human rights. Sang’s visit follows a difficult period in which his regime has imprisoned bloggers, religious leaders and dissidents; curtailed labour laws; and again taken control of what one Vietnam expert called the “commanding heights” of the economy. Sang, sitting next to him in the Oval Office, mentioned the legacy of the Vietnam war and said “we still have differences” concerning his country’s human rights record. Before the two parted, Obama referred to a letter that Sang had shown him. In it, the president said, Ho Chi Minh expressed his hope to then president Harry Truman that Vietnam could co-operate with the US. “President Sang indicated that even if it’s 67 years later, it’s good that we’re still making progress,” Obama said. Vietweek Staff, Thanh Nien News – Vietnam has strongly condemned the actions of a Chinese ship that chased and illegally boarded and stole belongings of two Vietnamese fishing vessels on July 7. The incident took place in Vietnamese waters off the Hoang Sa (Paracel) Archipelago. “These acts have violated Vietnam’s sovereignty over Hoang Sa Archipelago and Vietnam’s sovereign rights as well as its jurisdiction over the East Sea,” Vietnam’s Foreign Ministry spokesperson Luong Thanh Nghi said in a statement on July 17. “It runs counter to the spirit of humane treatment of fishermen, the stipulations of international law and the spirit of the agreement on basic principles guiding the settlement of marine issues between Vietnam and China, as well as the Declaration on the Conduct of Parties in the East Sea (DOC),” he said. Local media reported that the Chinese ship chased after the two Vietnamese fishing boats of Quang Ngai fishermen which were fishing in their regular grounds in Vietnamese waters. The Chinese crew went on to board and search the Vietnamese boats, cause some damage and take away some property. Nghi said a representative of the Vietnamese Ministry of Foreign Affairs has met Chinese Embassy officials in Hanoi and handed a diplomatic note protesting the act. Vietnam has demanded that China launch an investigation and strictly deal with the wrongdoings, compensate the Vietnamese fishermen, and prevent the recurrence of similar incidents in the future. During a visit to China last month of Vietnamese President Truong Tan Sang, the two sides agreed to establish a hotline to resolve fishing incidents in the contested waters of the East Sea, internationally known as the South China Sea. “The latest fisheries incidents are an early test of both sides’ abilities to sustain and implement the Vietnam-China joint communiqué signed in June, particularly the agreement to set up a hotline to defuse incidents involving fishing vessels around the Paracels,” said Euan Graham, a maritime analyst with Singapore’s Nanyang Technological University. Both Vietnam and the Philippines have complained about Chinese activity and even harassment in contested parts of the East Sea which covers important shipping routes and is thought to hold untapped oil and gas reserves. China’s claim is by far the largest, forming a vast U-shape over most of the sea’s 648,000 square miles (1.7 million square km), including Vietnam’s Truong Sa (Spratly) and Paracel archipelagos, a move emphatically rejected by international experts. Huy Duong | cogitASIA – With the South China Sea disputes remaining intractable, the need to manage them is paramount. Worldwide, joint development of disputed areas has proved to be a hallmark for managing disputes, yet this continues to elude the claimants to the Paracels, Spratlys, Scarborough Reef, and the central part of the South China Sea. Dispute resolutions and joint development are not new to the South China Sea countries. These countries have successfully demarcated a number of maritime boundaries, including Indonesia-Malaysia, Malaysia-Thailand, Thailand-Vietnam, China-Vietnam, Indonesia-Vietnam, and Brunei-Malaysia. In the Gulf of Thailand, Cambodia and Vietnam have agreed to an area of “joint historic waters” since 1982. 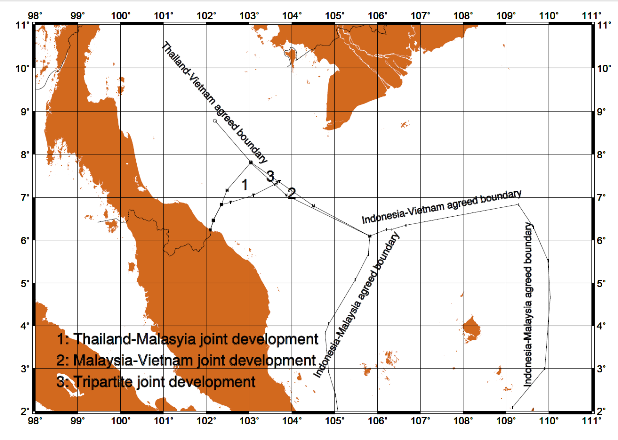 Around the entrance to this gulf, Malaysia, Thailand, and Vietnam have agreements on three areas of bilateral and trilateral joint development, the first of which dates to 1979. 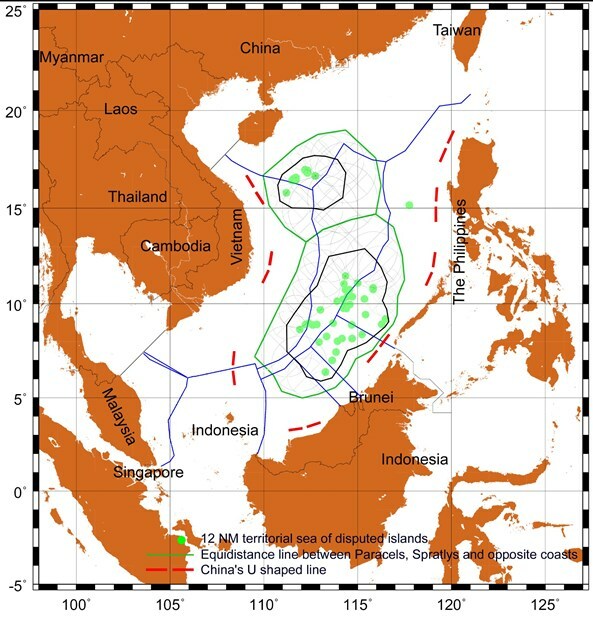 Boundaries and joint development areas in southern South China Sea. Source: Huy Duong, all rights reserved. These successes depend on the conflicting claims being clear and reasonable—which results in small well-defined overlaps—on negotiations in good faith, and on the absence of sovereignty disputes over islands. Why have these successes not been repeated for the disputes in the central part of the South China Sea? First, these disputes involve unresolved sovereignty disputes over islands, which add complexity to the maritime disputes and often carry political and emotional undercurrents. However, this should not matter for the provisional arrangements of joint development because their raison d’être is the existence of unresolved disputes; arrangements for joint development normally define the limits of the disputed areas and a means to share the resources in a way that is independent of the relative strengths of the claims. Most importantly, there is no agreement on where the limits of the disputed areas are. Joint development of the disputed areas is not possible if there is no agreement on their limits. China’s actions at various points along the U-shaped line suggest that it is setting the stage for claiming certain rights within the area approximately indicated by that line. This area extends beyond the equidistance line between the disputed islands and other territories, therefore China’s position is inconsistent with international law because according to jurisprudence on maritime delimitation, the waters belonging to these islands would fall far short of this line. China’s position creates a large, asymmetric, ill-defined area of overlapping claims that would make joint development in this area disadvantageous to the other claimants. Vietnam and the Philippines see the 200 nautical mile exclusive economic zone (EEZ) extending from their undisputed territories as sacrosanct and unaffected by the potential EEZ entitlement of the disputed islands, but neither has stated whether it claims EEZs for these islands elsewhere. Malaysia has been silent on the question of potential EEZ entitlement of the disputed islands. Brunei only claims Louisa Reef, and is unlikely to demand EEZs for other features. Comparing this situation with successful dispute resolutions and joint developments elsewhere suggests that these successes have not been repeated here because the following factors are missing: clear and reasonable claims by all parties, an agreement on where the disputed areas are, and good faith. Despite the unknowns, it is clear that China seeks to maximize the disputed areas, while the Philippines, Malaysia and Brunei are likely to seek to minimize them. Vietnam seeks to reduce the disputed areas, but its need to reduce them to the 12 nautical mile territorial sea around the disputed islands is probably less acute than that of the Philippines and Malaysia. This is because most of the disputed islands do not lie deep in the 200 nautical mile EEZ emanating from Vietnam’s undisputed territories. Nevertheless, it would be beneficial for Vietnam, the Philippines, Malaysia, and Brunei to take a common position, so their views are likely to converge. The greatest difference will be that between China’s wish to maximize the disputed areas and the other countries’ wish to reduce and minimize them. Could the “quarter distance” lines, in black, be the maximum limits for the disputed waters? Source: Huy Duong. All rights reserved. A compromise might be for the claimants to define the areas of joint development along the lines used by the International Court of Justice in its solution to the Nicaragua-Colombia dispute, which gives Colombia’s small offshore islands no EEZ, and larger ones an EEZ that extends a quarter of the distance to Nicaragua’s coastal islands. If a similar arrangement is applied to the South China Sea, then the maximum limits of the areas of joint development will be the black lines in Map 2, which seems to be a reasonable compromise for all parties. The question is whether every claimant has enough good faith to define the areas of joint development in any reasonable manner. Mr. Huy Duong contributes articles on the South China Sea to several news outlets including the BBC and Vietnam’s online publication VietNamNet. See more by this author.